Product #21473 | SKU 13000306 | 0.0 (no ratings yet) Thanks for your rating! 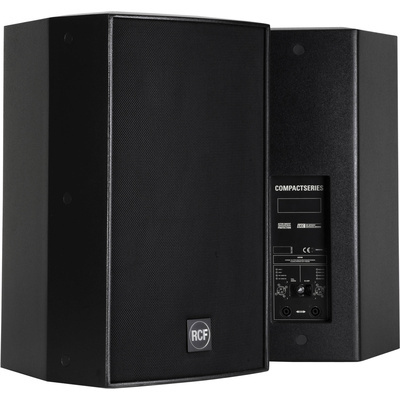 The black C5212-96 Acustica Series 500W Passive Speaker from RCF is a full-range versatile two-way loudspeaker offering substantial power and efficiency for several professional applications. It can be used as a main unit in permanent installations, or as a supplementary fill in large speaker systems. The Constant Matching Design technology helps guarantee an optimal transition between the high-frequency horn polar pattern and the low-frequency woofer directivity. The hi-frequency transducer is a 1.4” RCF precision compression driver with a 2.5” voice coil. The low-frequency transducer is a 12” RCF precision woofer with a 3” voice coil. The speaker also includes a high-level crossover network that features low induction values in series with the woofer. This innovation, named LICC (Low Impedance Compensated Crossover), delays reduction, reduces phase shift, and lends superior transient response. Dynamic high-frequency driver protection is accomplished with the RCF AMCDP (Active MOSFET Compression Driver Protection System), which is chosen to complement the driver power curve. The internal crossover can be easily bypassed for bi-amplification. The cabinet is made of Baltic birch (heavy duty painted) and allows different installation options. It comes equipped with top and bottom multiplates for either wall or suspended mounting with chains. The installation points are available on its rear panel as well. The steel front grille is protected with a double layer polyurethane fabric and the front RCF logo is easily rotatable. Connections are made through 2 Neutrik SpeakON NL4 connectors (audio input and parallel link output).